This guide is about how to evaluate the complex systems that make up local early help offers, which may involve many partners and multiple programmes and services. Some local authorities are already evaluating their early help services. Many more would like to but are struggling with how to do this. People are doing what they can, but there are inherent challenges in evaluating complex and multifaceted systems, and a lack of capacity locally. Questions about impact, attribution and cost savings are not straightforward to answer, and the necessary technical expertise, capacity and resources can be difficult to find. The best impact evaluations, which can draw causal links between services and family outcomes, involve randomising which families receive or don’t receive services. Due to its complexity, early help is difficult – but not impossible – to evaluate in this way. We highlight examples of good practice in this guide, but we are not aware of any evaluations of local early help systems which are robust enough for judgments on whether the services are the cause of improved outcomes for children and families. Various guides are available on how to evaluate. These tend to cover evaluation practice in general, or how to evaluate individual programmes, as in our guide, 10 steps for evaluation success. The gap this guide aims to fill is on how to carry out, or intelligently commission, impact evaluation on local systems of early help. This guide provides advice on how to apply the principles of good impact evaluation to complex local systems, such as an early help offer. The six principles are intended to help service managers and commissioners to find out what difference the local system is making for families. They are not arranged in order of importance or implementation; all will help to build a strong evidence base, as part of developing and continuously improving services. 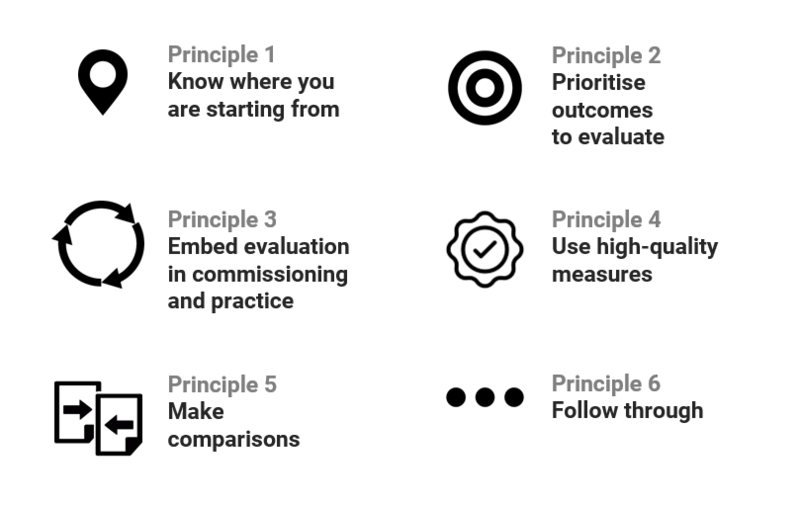 These principles apply primarily to evidence generated locally by those involved in service delivery, but they are also relevant when thinking about commissioning an external evaluation. Most of the work needed to apply the principles will focus on making a service more evaluable – more ready for evaluation – rather than actually carrying out an evaluation. External evaluators cannot help here: only service commissioners and managers can make services more evaluable. However, local areas may need to look externally to find the expertise needed for some of the techniques that are discussed. Elaine is a research officer at EIF.